The chain fruit cholla looks as much like a tree in the desert as a cactus possibly can. It has a central trunk from which sprout many spiny "branches". It is commonly found in dry, sandy soils of bajadas, valleys floors, and plains of the Sonoran and Chihuahua Desert, south Arizona and northwest Mexico. It is found at elevations up to 4,000 feet above sea level. The segmented branches have light-green leaves about 1/2 inch to 1 inch long when they are young. One inch long white and pink flowers streaked with lavender bloom from June to August. The flowers bloom at the end of the branches and on old fruit. The pear shaped fruit is about 1.5 inches long and half as wide. Clusters of these fruits sometimes stay attached for many years. New flowers will bloom on them every year and the chains grow longer with every year, sometimes as long as 2 feet. That is why they are called chain fruit cholla. giving you the impression that the cactus jumped at you. They attach themselves to desert animals and are dispersed for short distances. The ground around a cholla is usually covered with segments that have fallen off the parent. The fruit is not always fertile and the cholla relies mainly on fallen stem joints and fruit to take root and grow new plants. During droughts animals like the Bighorn Sheep rely on the juicy fruit for food and water. Large forests of chain fruit cholla grow in Arizona. The cactus is not considered to be vulnerable or endangered, mostly because they grow in inaccessible and hostile places of the desert. 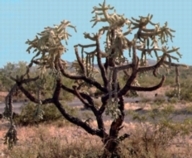 "Chain Fruit Cholla (DesertUSA)", http://www.desertusa.com/mag98/may/papr/du_chaincholla.html, (9/7/02). "Chain Fruit Cholla", http://www.dbg.org/Involved/chain_fruit_cholla.html, (9/7/02).